Occupy Oakland the night of Wednesday, October 26th. j_sight/yfrogThe Occupy Oakland protests turned violent Tuesday evening when police officers cracked down with rubber bullets [OPD denies but said it could not speak from 15 other agencies on scene, see more on this below], tear gas, and flash-bang grenades on protesters marching through downtown Oakland. Around 75 people were arrested Tuesday morning when police dismantled the Occupy Oakland encampment in Frank H. Ogawa Plaza. A crowd is gathered there again tonight. What follows is a Storify roundup of news and eyewitness accounts, including from our own Gavin Aronsen (@garonsen), Tim McDonnell (@TimMcDonnell), and James West (@jameswest2010), who are on the scene. 10:55 p.m. 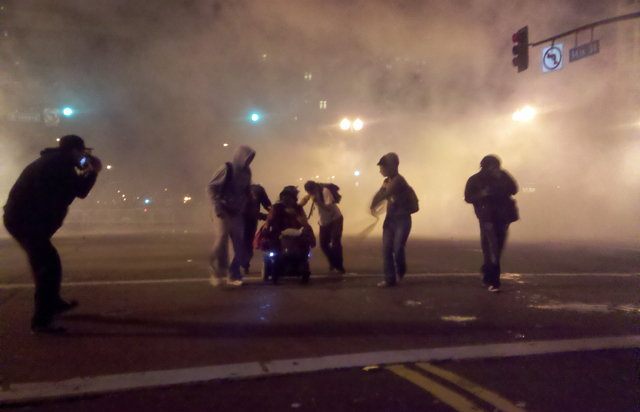 It was a peaceful night in Oakland. At a press conference, Mayor Jean Quan promised a “light police presence” for the next few days, to allow an opportunity for “dialogue” with the protesters. 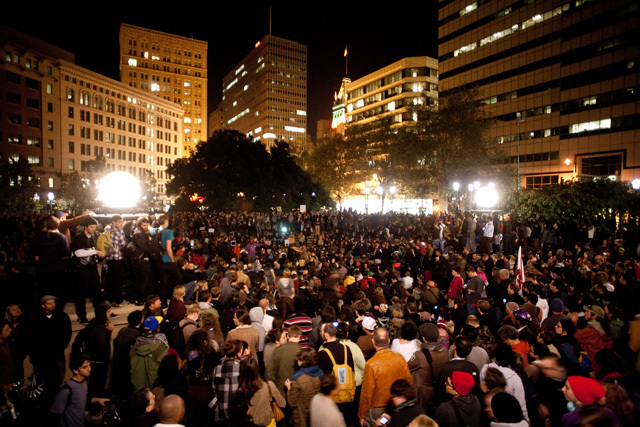 Shortly afterward, the Occupy Oakland General Assembly passed a proposal to organize a general strike November 2. (Historically, a general strike has meant that everyone participates—not just people in a particular union or industry, not even just workers. Students might stay home, cab drivers might park their vehicles, and so on. What this would look like in 2011 America has yet to be determined; as Gavin notes below, our last general strike came just after WWII. In Oakland. As we write this, what’s left of the protest crowd, still several hundred strong, is march-dancing down Broadway to the strains of classic pop. Meanwhile our reporters (whom you can follow on Twitter for live updates: @garonsen, @jameswest2010, and @timmcdonnell, having found the downtown Oakland BART station closed, are headed over to San Francisco in our editorial web producer’s (@DireWolf11) car. Josh Harkinson, who covered Occupy Wall Street for us for the past few weeks, is there as well. So are several San Francisco supervisors, trailing conspicuous entourages. James also interviewed the “Notorious Irish Guy,” who shows off what he says is an injury from a rubber bullet (plus the bullet itself).